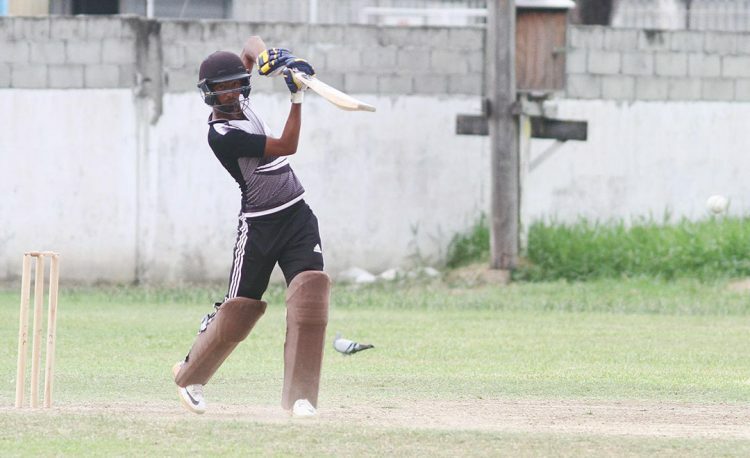 West Indies Under-19 selectee Raymond Perez, yesterday produced an impressive knock to spur the Demerara Cricket Club (DCC) to a thrilling four-wicket win over Everest Cricket Club in the first semi-final of the Georgetown Cricket Association, Carib Beer, first-division T20 tournament at the DCC Ground. Perez, who is developing quite a reputation for himself, swatted Bhaskar Yadram for 32 runs off the penultimate over to send his side’s supporters in a frenzy after DCC needed 39 runs from 12 deliveries for an improbable victory. DCC, after winning the toss, inserted Everest who cantered to 160 for 8 on the back of an even 50 from Troy Gonsalves. The right-hander, who started slowly and blossomed as his innings went along, stroked two fours and five sixes and received support from national T20 player Chandrapaul Hemraj, whose 28 included three sixes and two fours. DCC’s bowling was led by Steven Sankar who grabbed a hat-trick claiming 3 – 27 from two overs while skipper Christopher Barnwell took 2 – 11 from his four overs. DCC, in reply, were 34 for 3 after the first power play with Tevin Imlach (8), Brian Sattaur (0) and Kevin Boodie (14) all back in the hut. They slipped into further trouble when skipper and trump card Barnwell (15) was bowled by national Under – 19 off spinner Ritchie Looknaught with the score on 41 – 4 in the eighth over. It was 53 – 4 at the halfway point with Sherfane Rutherford and Perez at the crease and DCC still needing 108 more runs to pull off a victory. The two started to open their arms with Rutherford taking 14 runs off the 11th over bowled by Saheed Mohamed. Perez too joined in the act and spanked Looknaught for a maximum, much to the delight of his teammates. Rutherford once again took a liking to Mohamed and carved him over cover for six, then followed that up with a drive over long on to carry the score to 88 – 4 at the end of the 13 over. The duo, who shared in a 64-run partnership, mixed aggression with smart running between the wickets and saw the score to 101 with 60 runs needed from five overs. Tagenarine Chanderpaul, however, delivered a decisive over, costing just six runs and he also accounted for Rutherford who held out to wide long off and was brilliantly taken by Yadram for 38, a knock which included two fours and three sixes. 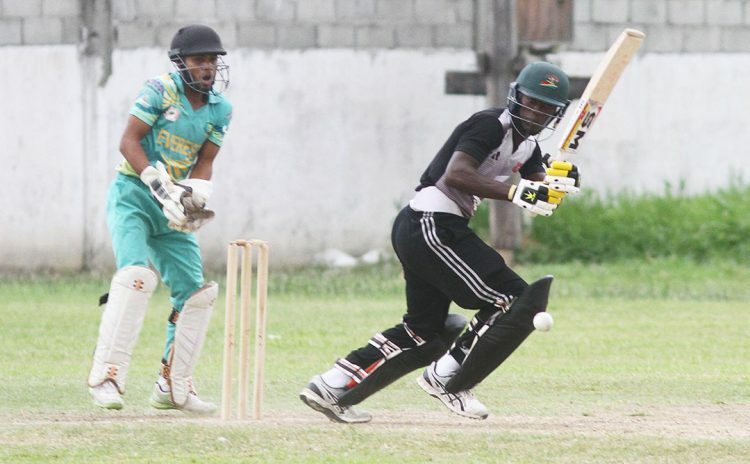 He fell with score on 105 – 5 and Keemo Paul strolled to the crease with DCC still needing 53 from 24 deliveries. Paul got into his stride, taking two boundaries off the 17th over, bowled by Hemraj to keep things interesting. Chanderpaul, though, struck again to remove Paul (11) in the 18th over with the score on 121 – 6. With 39 needed from the final two overs, Perez, showed why he is regarded as one of the more promising youngsters by stepping to the fore and spanking Yadram for 32 runs, decorated with four nonchalant sixes out the ground to post his 50 but more importantly, taking his side closer to victory. Kemol Savory then fittingly ended the assault with two maximums to carry the 166 – 6 from 19.3 overs. Perez ended unbeaten at 58 with four sixes and three fours while Savory ended on 12. Looknaught, who bowled impressively and had the wicket of Barnwell, finished with 1 – 18 from four overs while Gonsalves took 2 – 26 from three overs.